He could arrange that for some things – and travel thaumaturgy worked on most of methods of traveling around Yu-Shan OTHER than the Canals (which already had more powerful travel magic in operation and went by fixed routes, so slipping through shortcuts wasn’t an option), but it would attract a LOT of attention. Fortunately Gorim had been happy to establish a route nearby for him. He’d have to think up something really nice that he could make for him! There weren’t any urgent demands in either. Maybe they really WERE going to wait until after he’d completed a project or two and they were sure that he could handle making at least the basic stuff. There was more grass in his mailbox – evidently Three Toes wanted to make sure its domain was well fed = but it was easy enough to forward that to the museum. Well after all, the Factory-Cathedral was THE obvious place to watch him. Unfortunately, whoever-it-was was far enough away that the general magical chaos of Yu-Shan covered him, her, or it very nicely indeed. A serious attempt to find out who it was would require some fairly major active spellcasting, rather than just passive sensing. It wasn’t like it mattered very much anyway. After all, Yu-Shan was pretty much the intrigue capital of the cosmos, there might well be more than one observer, and he wasn’t actually up to much of anything at the moment anyway. He had all the official orders to review, ingredients to plan to acquire, more machines and functions of the place to familiarize himself with, and all the stuff he was SUPPOSED to be doing! Well, except for eating too much candy. If it was Gramps checking up, he was probably in for another lecture about laying off the sweets. Hmm… So far he’d used LOTS of thaumaturgy at master levels, skill at tinkering with Manses (if someone had been looking closely), and his possession of a good speed-up charm. That was… nothing yet beyond the abilities of a strong god-blooded, but definitely well above the average god-blooded youngster. At the moment, any spies probably thought he was simply the son of someone genuinely important. He set up a privacy veil and a small divination to keep him aware of surprise inspections (AND spies), but – for the moment – observing him was simply BORING. He obviously had great quantities of paperwork and filing and project planning to do – and if you wanted to watch that, you could do it pretty much anywhere in Yu-Shan. The sensation went away after a few hours. By the time the line shut down eight hours later, the observers were long gone – and he could work up the Rods of Construction in peace. A good thing that he just needed to tap into the Factory-Cathedral’s essence-flows for that! Running around and operating everything at high speed might attract attention again. Accelerating things to that degree burned through monstrous amounts of essence of course, as well as requiring hours for the recharging, but that was one of the reasons why he’d brought so many of his assistants! Even so, he didn’t quite manage to get them done. He really needed some way to recover essence faster! Maybe some more hearthstones? It was so hard to get strong ones though. Being able to store more would help. Maybe he could arrange that? There were supposed to have been “essence batteries” once, but he hadn’t heard of any of them since Gaia had reshaped Creation. Only artifacts that focused or stored essence for their own use. Perhaps the rules had changed? Oh dear! It would probably be a good idea to learn a combat charm. He had a nasty feeling that there might be trouble during that trip to the Amazon. Perhaps some sort of evasive illusion? He’d also need to come up with a some minor artifacts and other gifts for Gri Fel to offer the gods on whatever committees were in charge of assigning city gods, as well as (perhaps) something for a few Sidereals, but there was time for that. That “plan” was still pretty vague and he didn’t even know who he’d have to talk to (or bribe) to get Gri Fel into the running for Arcosanti, but at least it was underway. And he could ship their tools back to the Masons! Well, that could certainly wait until tomorrow; they probably wouldn’t expect them back anywhere near that soon… He’d expected a little more argument there, but they apparently were a group that handled manse maintenance, thaumaturgical education, and initiated the occasional terrestrial-circle sorcerer. Perhaps the last remnant of the realm thaumaturgy schools? They obviously had ties to the Dragon-Blooded; perhaps they also ran some interference for their operations? He had to wonder how many actual thaumaturgical schools were left… It could be quite hard to tell the difference between a kook and someone running a cover or distraction! Sunday was… mostly uneventful. Breakfast, a few hours to file stuff, sending their tools back to the Masons (via a secure bonded courier, with some wards and spells on the package to make sure it got their safely and a couple of spirits to watch it), dropping by the Factory-Cathedral to “check things” (and to finish up the Rods), pick up some fudge, see a few sights in Yu-Shan, spend some time playing video games with Ixian, a bit of manse maintenance, keeping up good relationships with the neighbors, teach his short class in Thaumaturgy in the park (the Coatl and Inukami handled most of that), and an evening with his friends. OK, so some of them were fairly strange friends from school, but that was all right. He was barely on time for school Monday. The Inukami felt that he’d been pushing too hard, and had made sure that he slept in. First up… it would have been history, but at the moment it was a free period for research on that essay. A good thing it wasn’t due for a week and a half! Picking a topic was HARD. They all sounded like fun! At least the school library would have enough to give them all a preliminary look, evaluate some pros and cons, and settle on a topic. Hmm… There were quite a few Shogunate-era sources in the library; they quite dominated the First Age material. That would make the interactions between the daimyo the easiest of the bunch. The problem there was distinguishing the court propaganda from the facts. That also made the Contagion the next best topic, although the sources from THAT period were largely from after the fact (and depressing to boot). The information on Merela was also largely written after the fact, although the coverage was good; there were several books on her – and on the construction of the Five-Metal Shrike. The Solar and his Lunar mate in the time of the Cascading Years would require the most independent research. Still, if he wanted a good grade, he’d need to do out-of-school research regardless… Merela then. He didn’t want to get absurd about it. Hmm. The most detailed and cited source in the school library was Toramna’s History of the Deliberative Under Queen M-R-L – a monograph supposedly dating back to before that infamous Calibration banquet in Meru. Fortunately, he could check this copy out, as it was a copy of the original. A good thing too, the original had Linguistic Charms in it that locked you into reading it. They’d probably done something annoying too! Hopefully the copy didn’t… He divined at it just to check though. It looked like… it had carefully had the Solar social power removed from the text. There was an entry in the credits on it for the Sidereal who had used Charm Redirection Technique on it, making it safe for everyone to read. Well that was nice of him or her! He checked it out, along with an armful of other books, and considered where else to check after this batch is done in a day or so… Yu-Shan had no shortage of libraries, but a full quarter of them (including a lot of the best ones) were open only to high-ranking Celestial functionaries and the Chosen of Secrets. The best, of course, would be to go to the Forbidding Manse of Ivy, which was the biggest library in Yu-Shan, if not all Creation – but it would be kind of risky. Hey! Wait! Being in charge of a Factory-Cathedral was good for more than he’d thoght, even if it did eat a lot of time! He had authorization to dig into almost any library he wanted to! He’d have to try looking up some other stuff! Well, probably not the Forbidding Manse of Ivy (it didn’t like it if you failed to use it’s full name). Poking around in THERE would really draw attention. Sadly, there wasn’t any time to go library exploring before his self-defense class, but there was always after class and work. That was more basic staff work – or it was until someone tapped him on the shoulder in the middle of a sparring match. Elissa just beamed – and then looked back over his shoulder and appeared a little worried. Charles stepped back from her and THEN looked to see who it was. It was young Hiranaya – one of the more advanced swordsmanship students. He had orange skin and red hair that flickered and shifted, despite the fact that there wasn’t much of a breeze through the dojo windows today. From what Charles had heard, his parent was associated with the element of fire. Charles got the feeling that he was trying not to make a smart comment about his sword skills. He looked at the instructor to see if he approved. HIS first thought was, of course, “Are you sure it’s not Thaumaturgy you want to practice? I’m GOOD at Thaumaturgy” – but there was a quiet nod there. He apologized to Elissa and got on appropriate sparring floor. Oops! Hiranaya was a faster starter than he was! And pretty good! If it hadn’t been for the talisman that enhanced his reflexes and a quick duck back, he’d have taken a pretty good shot there! Hiranaya deflected his shot, but not too easily – and swung back with a blow that Charles very nearly COULDN’T dodge – although he sacrificed enough of his defense in doing so that Charles managed to slip past his block and make contact that time (for minimal damage), leaving Hiranaya slightly staggered – although he steadied himself quickly. Charles waited politely to make sure that Hiranaya wasn’t really hurt – causing the sword instructor to groan slightly; even in a SPARRING match you didn’t check on people who’d only gotten bumped and were in no distress – and it was all too obvious that that was likely to be his natural tendency in combat too! The staff instructor seemed rather pleased and satisfied however, although some of the other instructors were muttering quietly. Drat! He’d been showing too much of his boosted reflexes… It was hard to stand and get hit though! The natural tendency was always to duck! Something seemed to be bothering him a bit, but Charles couldn’t really tell what it was. Sindri seemed a bit… interested too. Oh well. Perhaps he’d had some queries and didn’t like Sidereal or other high-level interest in his students? Most martial instructors really wanted to see all their students do well, and – in Yu-Shan – high-level interest in a student rarely boded well… Perhaps he was suspecting that he was going to wind up as a Sidereal? That surely didn’t happen very often, but it was surely possible. Oh! Maybe he was suspecting a Lunar Exaltation? The most commonly-absorbable artifacts were moonsilver; it was very good for that kind of thing – and he HAD shown himself to be extremely tough and fast-healing. Perhaps he’d better find a lunar who was willing to help out and forge the Lion Ring. It would be fun to use anyway and it would make a great red herring while remaining within the bounds of what was possible for a god-blooded! Oh well. It was at least as likely that he was just wondering how many artifacts Charles was using. Hiranaya left Charles to continue sparring with Elissa, albeit with one last look over his shoulder. That sparring match was a bit more evenly matched – at least in terms of offensive skills. Fortunately, enhancing artifacts were quite expected, and even considered prudent. It wasn’t uncommon to give some to God-Blooded children either. Charles didn’t mind sparring, as long as no one got hurt. For the last class of the day it was music. Now THAT was a bother! He really wasn’t good at music to begin with, and (even worse) it was still voice training. He was (marginally) better with instruments and fairly creditable with computer-driven synthesizers! Oh bother. That wouldn’t be until after the woodwinds unit. Charles tried stunting up a traditional Irish ballad, and actually managed to roll a “10″ for two successes. It turned out to be a passable rendition; nothing professional, but better than the no successes at all he’d gotten last time. The teacher was somewhat pleased. Some improvement and an obvious effort. Work was… not especially busy. Now that he’d fed the pattern into the system, and started the production sequence, it only needed attention at critical points. He did check-sweeps for any problems every few hours – and continued checking the Cathedral throughly (also an excuse for lingering afterwards) – but there wasn’t much challenge to running the Factory-Cathedral until after the official workday when he could get to his own projects. The workers appreciated that. Micromanaging irritated them. After all, they were crafting-gods (however minor) and they knew their jobs as well as Charles did – or better. They did have centuries of experience after all. Nothing went wrong, so most of the “work” time went to research – until after work, when he finished up the Rods of Construction. He was keeping an eye out for surveillance and such. That was still only a privacy veil and a thaumaturgic ward, but the Factory-Cathedral had it’s own first-age wards, and was very hard to poke into anyway. Now that all the systems were booted up again, there were no more sensations of being watched for the time being. Hm… For a library he’d want one that was… primarily historical. A museum-type if possible. Preferably one run by a god of records or scholarship of some sort. There were countless libraries in proximity of the Perfected Lotus of course – although most of the ones with museums charged small admission fees. Oops! Also one that was near the offices of the Bureau of Nature! He had an appointment there in a few hours to explain the hipparions! Hopefully the gondolas were running smoothly! Off that way then, with an official summons to ease his way! Hm. His activities at the museum probably were causing more distortions in the loom than any mere thaumaturgy would, and that probably meant that some Sidereals had spent extra time on the loom to fix things. Oh well. Oddly enough, he felt somewhat less bad about making minor annoyances for the Sidereals than about annoying most other people. Probably something to do with the Usurpation; even though Devon had skipped out on that, it had still annoyed him quite a lot. The Bureau of Nature’s reception area had a lovely garden arrangement that was open to the sky, with some particularly impressive fountains. The receptionist appeared to be a major gardening spirit. He spent a minute or two appreciating the fountains and gardens. Besides… the receptionists desk was a towering thing on a dias displaying the grandeur of nature that he’d need to stand on tip-toe to peer over. She led him to a building made of only natural materials in the middle of the garden and into a meeting chamber well-decorated with wood. There are several deities here, including what appeared to be a very large Hipparion. The Hipparion neighed at him. The other gods included an anthropomorphic horse goddess in very fancy robes, a camel god, an alpaca god, and a minor looking deity who appeared to be here only to tend to the giant Hipparion. The gods gaped at him a bit. Was this child both powerful enough to resurrect species and – somehow – still naive enough to feel that “it would be mean not too!” was a sufficient reason for doing it? Or was it for pretty much ANYTHING?!?! There was a moments pause before the anthropomorphic horse deity cleared her throat. She nodded to the big Hipparion. Well, it was hard to be scared of a horse-gazelle-like creature you could tuck under your arm. Charles set up a link. Probably a fairly safe slum park… He’d been lucky. Charles released the link once Three Toes was done. Three Toes turned toward his attendant and looked at him like horses do when they’re hungry and promptly get some grass. The horse goddess was quite interested in what he had to say. There hadn’t been anything particularly private there, so Charles filled her in – which filled in some gaps for them. They’d see about getting him a softer stable floor. Charles thanked them for him. They had given him a very nice stable. Unfortunately, they seemed to have assumed that he cared about opulence – hence the floor being marble with rugs, which had eaten (even if he had thought that they were delicious). Charles kind of figured that Three Toes rather predated that entire notion. It was nice to help him! He was a very old – and rather innocent – deity. He’d been around in a time when politics didn’t matter quite so much up here. He could already imagine the old hands up here betting on how long before he got bureaucratically eaten alive. Fortunately, Three Toes also had no notable responsibilities or authority either, which made him a sort of pensioner really – even if that was almost unheard of in the Celestial City. Perhaps he had a side-career opening up as an uncomfortable reminder of what Yu-Shan and its residents had become over he centuries. Besides… the younger and more cynical, deities had to and recover from Charles and his overwhelming dose of happy niceness. Charles, meanwhile, went off to try and figure out who would need to consent to get Gri Fel a job as city god of Arcosanti. Maybe he could pitch it to the Bureau of Humanity as getting one of their most embarrasing out-of-work deities off their hands and to the Bureau of Nature as getting a highly respected elder of prior ages to handle a job – the city/nature preserve – that most of their deities had no experience with but which he did? 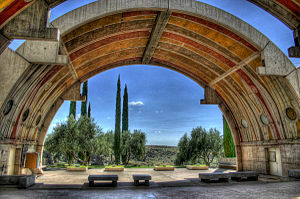 Cities hadn’t been full of greenery since the first few ages after all, and Arcosanti was. It looked like… city god was always a contentious position. Even the gods could never be sure which optimal settlement locations would be catapulted to prominence next, and everybody always wanted to be able to say that it was theirs – and there was a lot of potential in a green city. Still, an idealists experimental colony in a desert supported by tourism and with a major industry consisting of making souvenirs and art really wasn’t a big power-candidate – or at least he could pitch it that way. Still truthfully, but slanted a bit. Finding out which god e wanted was pretty easy. Urbis, the god of cities in general. He worked in the Bureau of Humanity. Getting in to see him was the hard part. He was a very busy deity and had to be selective about his appointments. He hadn’t placed any orders either… His job was quite secure. City father or mother comes with perks. God of cities, on the other hand, means you’re the one in charge of keeping all the city parents happy. Only a madman would want that, and Urbis had volunteered for it. From what little he could find out – he was no bureaucratic manipulator – the Sidereals were happy enough with him too. He could just turn up with an item for him. Perhaps propose a joint thing? A city god AND a nature god to work together? That might be interesting. The two bureaus did have their differences, what with pollution and all – but much of that was produced by power demands and construction – neither of which Arcosanti was big on. A fire demesne would be a great way to augment green power… Ah. Now, if the bureau of nature puts forward an suitable city god candidate along with a nature god candidate and a proposal to split the job rather than bickering… And he was in the area. Off to propose a dual candidate then. There were probably plenty of out-of-work nature gods too. And he was already at the Bureau of Nature. If they saw him talking to an out-of-work nature god, there would probably be an interview soon enough. Then THEY could propose things to Urbis, and Gri Fel could use his new Rod of Construction to show how ready for the job he was. Charles started divining for a good candidate. A land god most likely, preferably from an inhabited river valley near the fringes of the old pole of fire desert. One who used to approve of humans who lived “in harmony with the land” and with a decent personality. Preferably someone who was once prominent. That wasn’t too hard. Much like Gri Fel, the more suitable nature gods tended to live in nicer slum areas and visit the Bureau regularly. Since their areas had mostly fallen to natural disasters or reshaping, rather than to the full might of the Ebon Dragon, they were a bit less weary and listless. The one he found looked quasi-Sumerian. He had a very impressive beard, even in his current state. They weren’t very good table manners by modern standards. They’d be fine in Sumer, though. The Elder ate quite heartily. He liked the giant boar. Those were pretty trivial. One of the most minor artifacts, you could use it to turn quintessence and ambrosia into stuff and to smelt jade from ambrosia. Practically a standard household appliance in godly sanctums. (Charles) “I should be able to turn some up – and maybe a few other things. It may be a day or two, but I’d guess that that’s not a problem? I’ll set up a meeting with Gri Fel – or, if he doesn’t want it, another city god – and bring along some stuff for gifts… Where should I send to get word to you? Gri Fel was readily available. He wasn’t really that occupied – so Charles invited him to a meal. He could always eat another snack! Hm… Maya’s Vistas this time, where each table looked out over the vistas of dreams. Those were illusions of course, but they were confusing and hard to divine about. Illusion-guises were common enough there to provoke no comment at all. Gri Fel appreciated the free meal; Kiko was not the best cook. Gri Fel went on about the conflict with the hardy men of the mountains, the fearsome god, and his Full Moon friend for some time. Charles fished out a Rod of Construction and presented it to him. His eyes widened at that. He’d pulled a lot of it off the internet (Arcosanti did have a nice site) – and so he could spread out lots of printouts and things. Gri Fel pored over the information. Somewhat to Charles’s surprise, Gri Fel’s eyes lit up when he saw the farming information. Hm… Gri Gel had started off as the god of a small pastoral village near the Sword of Creation, which would later become the Imperial Manse and the focus of the Imperial City. Apparently he’d awakened his old memories of that. Well, that would be easy. As for something for Terapishim… Perhaps an agricultural booster? The plants fell under the Bureau of Nature’s dominion, while the actual plowed fields were a part of Humanity’s territory. Something to bless and nurture plants and such would be easy; all the field blessings were thaumaturgy, so something with a selection of such effects was fairly simple to make. Ah, first a mess of ambrosia cookers, than some fine teasets, then some Verdigris Staves! Those would require… a piece of wood from a barn that was returning to nature and a hundred different kinds of seeds from around the world. Those would be pretty easy to get these days! Oh yes! Tomorrow would be the field trip! A good thing he’d already compiled a list of the old manses in the area; he might be needing it!